Following on from the huge popularity of their music video “New Generation”, High Peaks Pure Earth has translated another song by Yudrug called “Waterfall of Youth – Dhondup Gyal”. 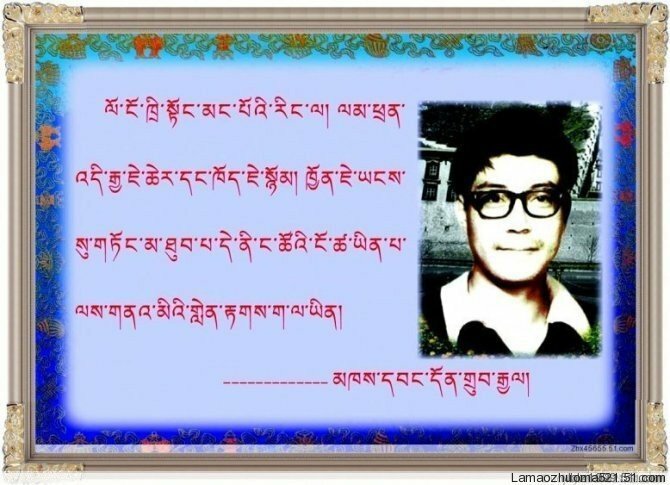 The song was uploaded onto their blog on November 27, 2010 and is a paean to writer, poet and critic, Dhondup Gyal (དོན་འགྲུབ་རྒྱལ་ – ‘Don rgrub rgyal). Dhondup Gyal was born in 1953 in Chentsa (གཅན་ཚ་ gcan tsha, Amdo, located today in Qinghai province) and is widely considered to be the father of modern Tibetan literature. Dhondup Gyal wrote under the penname of “Rangdrol”, meaning self-liberated. This is indicative of his limpid nationalistic bent and can be taken to have both a Buddhist meaning and modern political connotations. The title of Yudrug’s song is taken from Dhondup Gyal’s groundbreaking 1983 poem “Waterfall of Youth” (ལང་ཚོའི་རྦབ་ཆུ – lang tsho’i rbab chu) that caused a sensation when it was published, both for its radical literary innovation and bold nationalistic sentiments. As Shakya writes, “[…] Boldness in style and politics was characteristic of Dhondup Gyal’s writings. For the first time, the possibility emerged that, through-the medium of poetry and fiction, a genuine discourse on Tibetan modernity could occur. At stake were the future direction of Tibet and Tibetan identity in the latter half of the twentieth century.” Interestingly, the term “lang tsho” has no direct English translation. The word could be translated as “youth”, but this does not fully convey its connotations − it rather refers to the peak of youthfulness. It is the period when young men or women reach their peak in physical development, and there is an implicit connotation of energy and vitality in the word. The torrent and the force of the waterfall are metaphors for the burning desire for freedom, modernism and innovation. The energy generated by the torrent of the Waterfall became a metaphor for the pent-up vision of the younger generation of Tibetans. After their innovative and modern hip-hop song and music video “New Generation”, it seems as though Yudrug have adopted “Youth” as their signature theme, taking their cue and energy and inspiration from Dhondup Gyal’s words. I really support them, they are the essence of we Tibetans !!!!!!!!! The bright shining star of Tibetan literature deserving of praise! The lyrics are lively, the singing is also passionate! Hope that Tibetan literary circles will forever be permeated by Waterfall of Youth! If it were sung in Tibetan, it would be even better. Why aren’t you singing in Tibetan??? 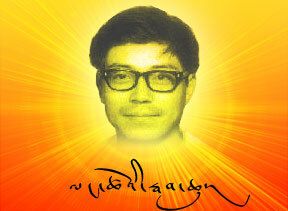 Dhondup Gyal committed suicide in 1985, he was 32. Below is the English translation of the lyrics to “Waterfall of Youth”, High Peaks Pure Earth has not subtitled the middle part of the song, the Tibetan rap is lifted from the “Waterfall of Youth” poem. Similarly, the Tibetan at the start and end of the song are also taken from the poem and are indicated in italics. It is somewhat ironic that the majority of the song is being sung in Chinese considering that one of Dhondup Gyal's primary concerns was the promotion of Tibetan language in genres other than religion, such as novels. And we could therefore assume that he would feel the same with modern music!! Don't be too quick to ridicule this song for using Chinese, the reality is that these days a lot of young Tibetans can't understand their own language that well, and what's more, if Yudrug had been singing only Tibetan, it would have been North Eastern Amdo dialect, which many Tibetans in Lhasa and Kham for instance cannot understand very well, even with subtitles. So in order to reach as many young Tibetans as possible with their message and praise for Dhondup Gyal they were wise to utilise Chinese. By the way, it's not like they are singing in ful blown Beijing pop singer Chinese either. Their pronunciation is heavily accented in the Tibetan style. We live in an age of contradictions and oxymorons, everything that was true 20 years ago has been turned on it's head. I think Dhondup Gyal would have understood this. The main thing is that his message has been taken up by Tibetan Youth of today and is still relevant to their lives. the link to the tibetan translation doesn’t work. Is there a website you can link me to? Thanks.